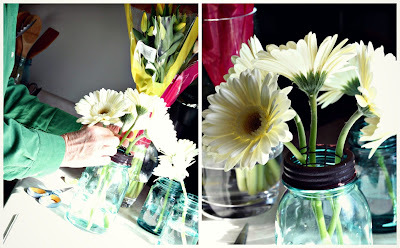 Who doesn’t love the look of fresh flowers in blue Ball mason jars? 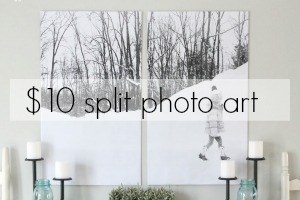 It’s such a classic look that can be switched up easily based on the seasonal flowers available. My mom, a budding floral designer (pun intended), is the one who arranged these gorgeous flowers in my grandmother’s vintage blue Ball mason jars. She found this Mason Jar Flower Frog on Amazon, which really helped keep the flowers in place! She only had one, so we used it on the large ball jar in the center of the table scape. 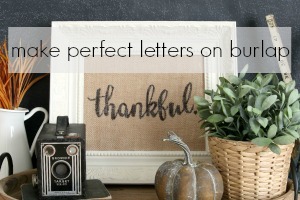 We’re both ordering a few more for future centerpieces and flower arrangements…we loved it! I tied the napkins with simple striped burlap ribbon that I picked up at Hobby Lobby for half price. 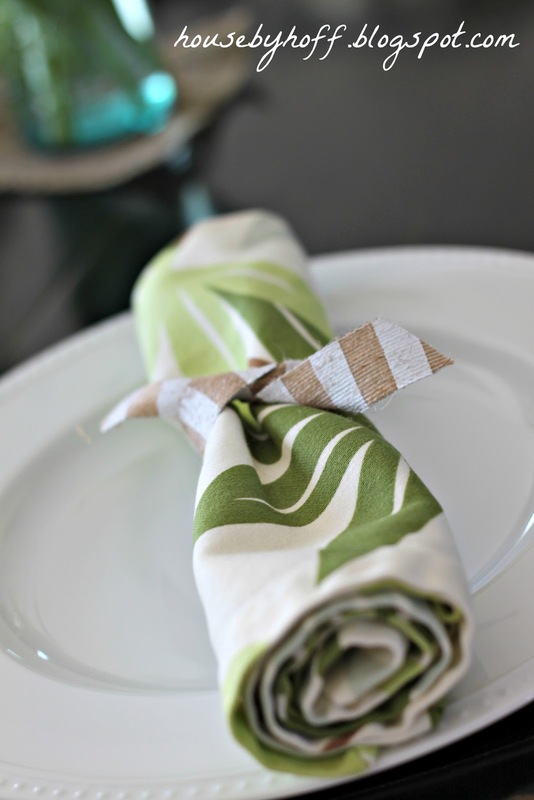 I also used this gorgeous ribbon in this centerpiece. This table scape has me thinking that I’ll be buying fresh flowers more often. There is something so pleasant about having them around. Love the flowers in mason jars…. 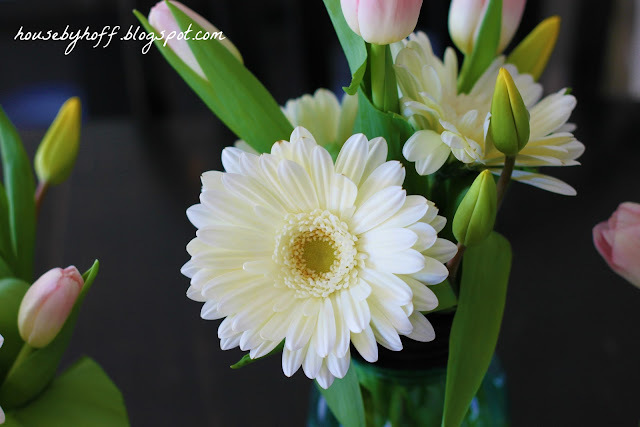 And I love to have fresh flowers around, always! I’ve started buying more potted flowers for inside to get them to last longer…. Thanks Dorinda, they make me smile too! I love how simple yet pretty they turned out! you can’t go wrong with mason jars and flowers! Every time I get flowers I ditch the vase at some point for a mason jar. So fresh looking! So cute! 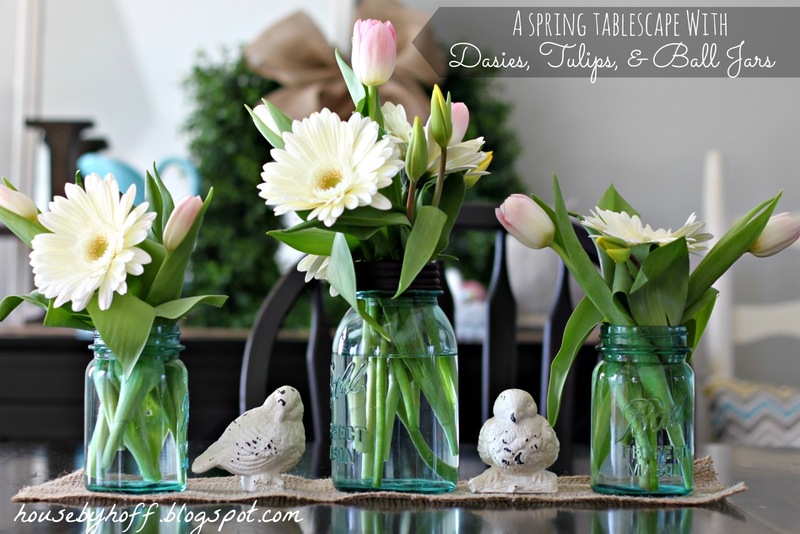 I love spring flowers especially tulips and the mason jars are perfect! 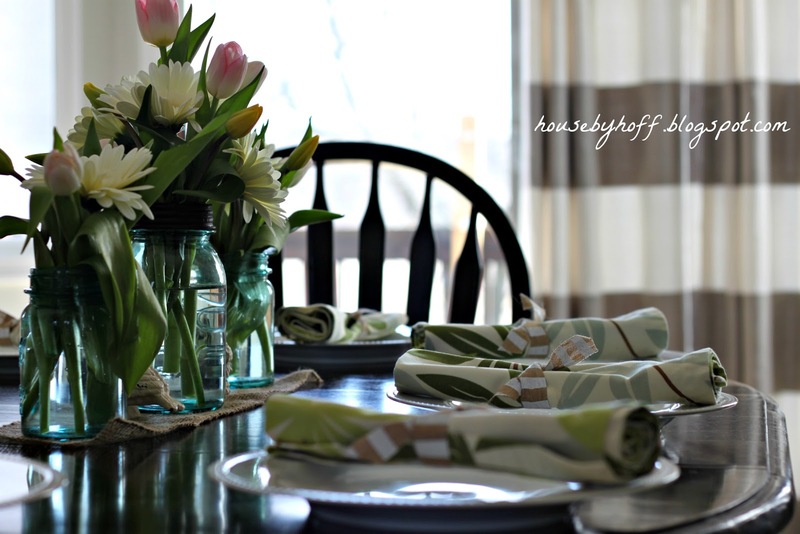 Your table scape is so pretty! Mason jars with fresh flowers are the perfect touch! Stopping by from Give Me the Goods! It is so beautiful, April! So happy you linked up to Give Me The Goods Monday! Can’t wait to see what goods you bring next week! BEAUTIFUL April. You are such a pro when it comes to styling – I always love what you put together! Gorgeous, April! I so want to find some of those vintage mason jars! 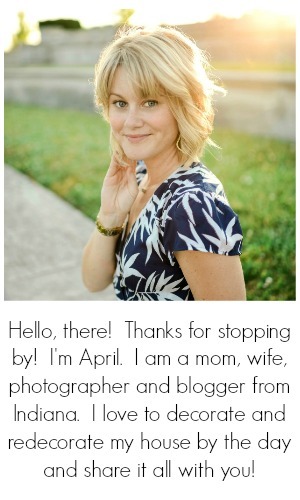 I’m following you through BlogLovin’ now… I can’t wait to see what you’ve got coming up next!